The Alfa Romeo Stelvio has already been around for a while, and the Italian automaker will introduce a new, posh, trim line at the 89th Geneva Auto Show called the Ti. 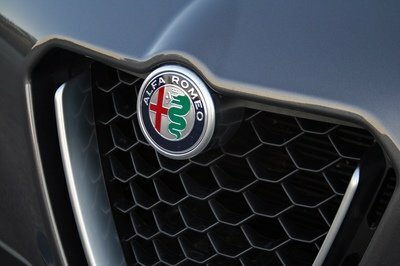 It stands for ’Turismo Internazionale,’ and it’s a nod to Alfa’s storied past. This variant will be equipped with the meatier of the two 2.0-liter, turbocharged, inline-four engines, new burnished taillights, and new wheels to round things out. This piece of news may already seem confusing to those of you that are familiar with Alfa’s American range of models. That’s because over in the U.S., Alfa is already offering the Stelvio Ti for the 2019 model year. In fact, you can choose between the $44,495 Stelvio Ti, the $46.995 Stelvio Ti Lusso, and the $47,295 Stelvio Ti Sport. All of these come with the 2.0-liter, turbocharged, inline-four engine too. However, there will be differences between the European-spec model and the U.S.-spec ones. If you are a true car enthusiast, you need to own an Alfa Romeo at least once in your lifetime. 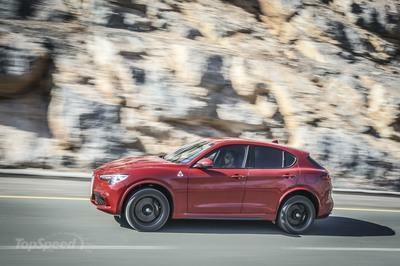 Driving the Stelvio Quadrifoglio really proves that the Alfa Romeo experience is still there. But, most importantly, the Stelvio feels special, and that really sets it apart from everything else. We spent a few days with the Stelvio and could not get enough, and that was just driving around town. If there was a race track around, we probably would not stop until there was no fuel or tires left. 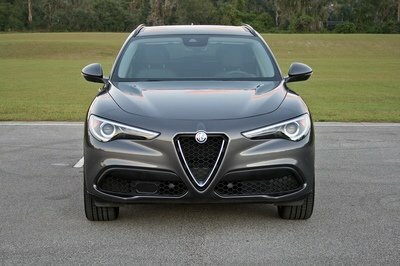 The Stelvio, at least in the Quadrifloglio configuration, is just a beautifully crafted machine that begs to be driven. Crossovers are vehicles designed to look like they can go off-road, but really be at their best on the road. Sure, some can do light off-roading, but realistically you won’t want to stray too far from the blacktop or the occasional bumpy gravel backroad. To this end it’s not trivial to know which of these 4×4-aping high riders are best out on the open (and sometimes twisty) road, since it’s where they will spend most of their time. But don’t go thinking that they are on par with more conventional car shapes, because their higher center of gravity and usually higher mass will affect handling. Safety is at the top of buyers’ lists these days, but what many don’t think about when browsing lists of cars rated with safety stars is that good, predictable road manners and sharp handling are one of the biggest safety features a car can have, since they allow the driver to avoid crashing in the first place. And while crossovers may give occupants a feeling of extra safety when they’re on board, their poor road manners bring this into question. Here’s a list of the 10 best handling high-riding vehicles ever made. Spurred by the popularity of the Stelvio SUV, Alfa Romeo is planning to build not one, but two new SUVs. One of these two models is a smaller SUV that will compete against the likes of the BMW X1, Audi Q3, Mercedes GLA-Class, Range Rover Evoque, and Volvo XC40. Among other things, the baby SUV will be launched with hybrid tech and Level 3 autonomous driving technology. Once among the greatest auto companies in the world, Alfa Romeo began to struggle in the 1980s. And needless to say, the 1990s and 2000s weren’t exactly great either. But the Italians regrouped and launched the 4C, thus regaining some of its past glory. The Giulia joined in to give Alfa Romeo its much-needed performance sedan, but the FCA-owned brand also jumped on the SUV bandwagon and introduced the Stelvio. Put into production 2016, the Stelvio also gained the famed Quadrifoglio package and went on to set a new lap record for SUVs on the iconic Nurburgring track. 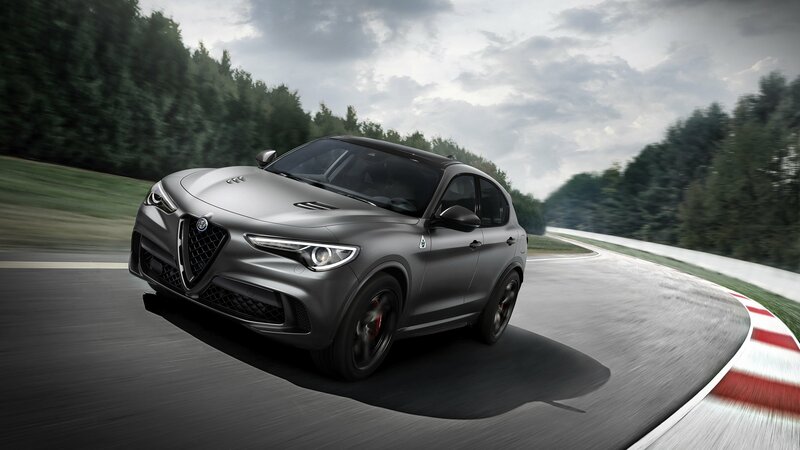 To celebrate the event, Alfa Romeo created the Stelvio Quadrifoglio Nurburgring Edition, an extremely limited version of the performance hauler. Currently the fastest production SUV around the Nurburgring, the Stelvio Quadrifoglio lapped the German track in seven minutes and 51.7 seconds. The tribute model comes in the same specs as the vehicle that set the record, but with a few extras on top. 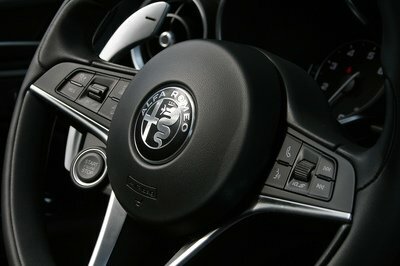 It’s also limited to only 108 units, one for each year that passed since Alfa Romeo was established in Milan, Italy. Let’s find out what the Nurburgring Edition brings to the table in the review below. The Stelvio Quadrifoglio Nurburgring Edition may not seem that special on the outside, but that’s because Alfa Romeo wanted to keep the SUV as simple as possible. Add-ons are almost absent on the outside, as they include just a few carbon-fiber bits, like the front badge, the mirror caps, and the side skirt inserts. Oh, and it has tinted windows for a sportier look and enhanced privacy. Unfortunately, the SUV doesn’t get the bare carbon-fiber roof from the Giulia Quadrifoglio Nurburgring Edition. More new features can be found on the inside, where Alfa Romeo added Sparco racing seats with carbon-fiber shell structure and red stitching, as well as a Mopar gearshift knob with carbon-fiber insert. The steering wheel is unique too, featuring leather and Alcantara, and carbon-fiber inserts. The Mopar-made floor mats have red logos. Convenience features are pretty much similar to the regular model. Highlights include active cruise control, a Harman Kardon premium audio system, the Alfa Connect 3D Nav infotainment system with 8.8-inch screen, Apple CarPlay, Android Auto, and DAB. 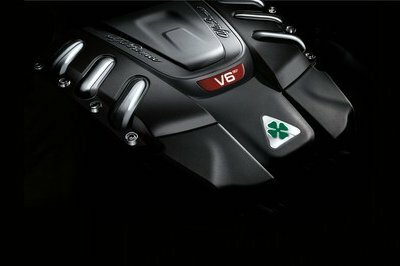 Under the hood, the Nurburgring Edition is equipped with the same 2.9-liter V-6 as the regular Stelvio Quadrifoglio model. But this doesn’t make it mundane, as the biturbo mill co-developed with Ferrari cranks out a solid 510 PS and 600 Nm of torque (505 horsepower and 443 pound-feet). Charging from 0 to 62 mph takes only 3.8 seconds while top speed goes as high as 283 kph (176 mph). All the power goes to the wheels through an automatic transmission and an all-wheel-drive system. The carbon-ceramic brakes provide the necessary stopping power. Production is limited to 108 units, one for each year of the history of Alfa Romeo. The brand says that this model is for collectors and the most loyal customers, so buying one might be an issue. Considering that the limited run isn’t sold out already. Read our full review on the 2018 Alfa Romeo Stelvio Quadrifoglio. Read more Alfa Romeo news. Read more Geneva Motor Show news. The wait for the official price of the Alfa Romeo Stelvio Quadrifoglio is over. The Italian automaker has announced pricing details for the performance SUV, and it’s not cheap. 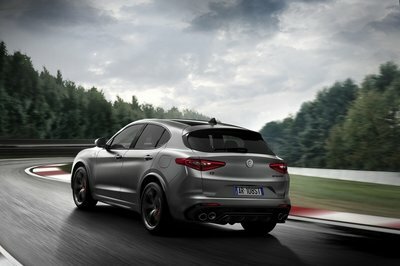 If you want one, you’re going to have to pay at least $79,995 to go home with what Alfa describes as the “world’s fastest SUV.” Throw in the destination fee of $1,595 and the total cost shoots up to $81,590. And, if you’re looking for options, well, at that point, your mileage and the subsequent price of the SUV will vary. 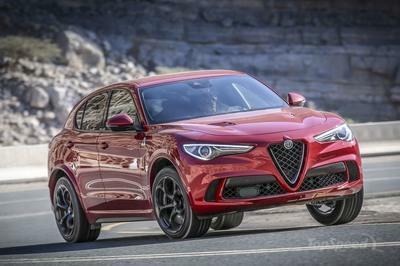 The announced price is a little steeper than a lot of us probably expected, but it is in line with how much some of the Stelvio Quadrifoglio’s rivals cost. The Porsche Macan Turbo, for example, can cost as much as $87,495 if you attach a Performance Package to it. Even then, the Porsche still owes 65 horsepower to the Stelvio Quadrifoglio even at that price. Likewise, the Mercedes-AMG GLC 63 S is priced at around $80,000. 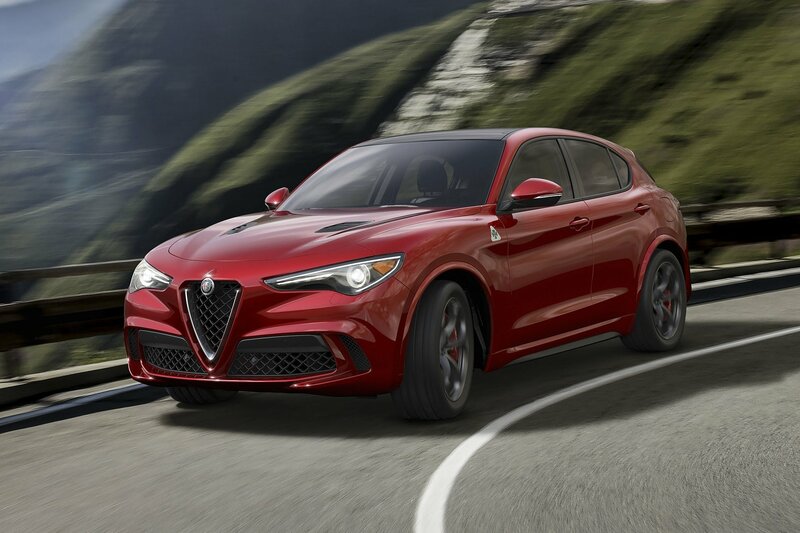 It has roughly the same amount of power — 503 horsepower — as the 505-horsepower Stelvio Quadrifoglio. 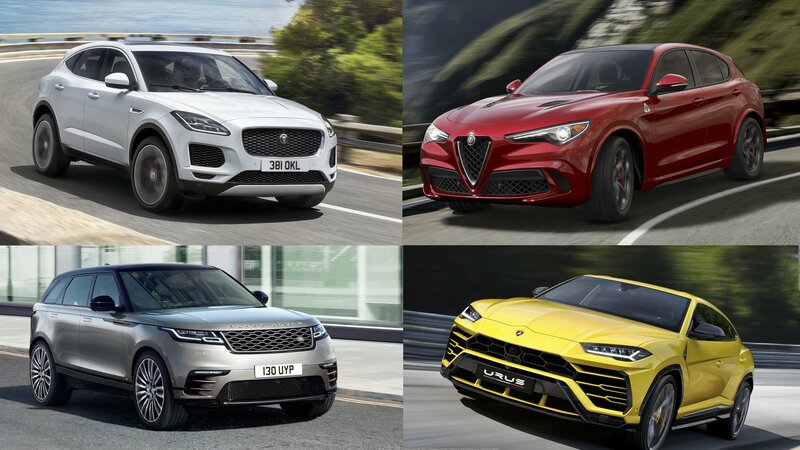 The only difference is that, unlike the Stelvio, the Macan Turbo and the AMG GLC 63 S are established performance models from established automakers that have been in the crossover and SUV business for a long time. 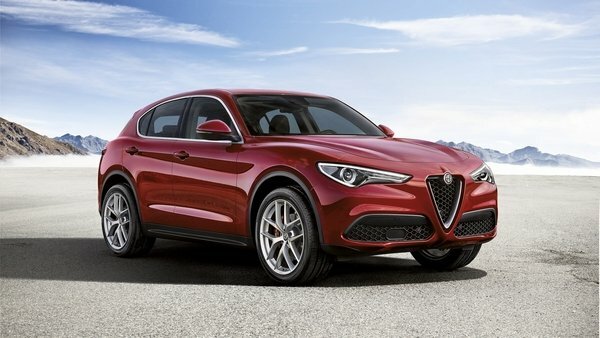 The Stelvio, on the other hand, is Alfa Romeo’s first-ever SUV. Is it worth spending that much on a first-timer? It’s hard to blame Alfa Romeo for settling into this price point for the Stelvio Quadrifoglio. Dropping its price below the Macan Turbo may have some advantages, but it’s not going to build the kind of attachment most high-priced vehicles get from their owners. I think it’s a fair price for the Stelvio Quadrifoglio. All it has to do now is to live up to its end of the deal and become the high-performance SUV it’s been hyped to be. Read our full review on the 2018 Alfa Romeo Stelvio. 2017 has been an amazing year for the automobile. Sales have increased across the board, high-performance models are quicker and faster than ever, off-roaders are more capable than before, and a slew of new models have hit the streets. That’s what we’re looking at here: the all-new vehicles the debuted in 2017. But more specifically, we’re looking at the crossovers and SUVs that made their initial splash into the fastest-growing segment in the industry. Before we dive in, it’s worth noting that practically dozens of SUVs and crossovers were revamped in 2017. Models like the Jeep Wrangler JL, Chevrolet Traverse, Mazda CX-3, and plenty more were made new again. But these are familiar nameplates. This go-round, we’re focusing on completely new models. Continue reading for more information. Alfa Romeo is making its comeback – both in the U.S. and around the world – an much of it hinges on the Stelvio crossover. Naturally, with crossovers being all the rage these days, Alfa couldn’t ignore the segment despite never having a historical tie with any high-riding, four-wheel-drives. Thankfully, Alfa didn’t built some clunky knock-off of a Wrangler or Defender, but rather, a smooth and powerful machine with looks that kill and an available Quadrifoglio drivetrain with its Ferrari-derived 2.9-liter twin-turbo V-6, eight-speed automatic, full-time AWD, and 505 horsepower. Even in its “base” form, the Stelvio’s 2.0-liter turbo-four has enough power launch the 4,000-pound vehicle to 60 mph in roughly 5.5 seconds. Prices start around $43,000 and crest around $48,000. The Quadrifoglio model hasn’t been prices at this time, but we’re expecting this monster to start somewhere around $75,000. And then there’s the name… Stelvio – it’s just so fun to say. 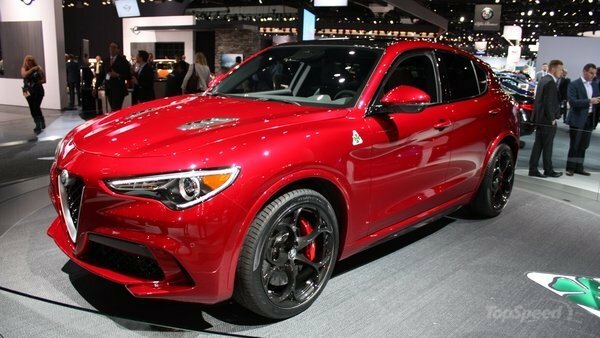 Add Quadrifoglio to that, and the name alone is worth the asking price. Read our full review on the 2017 Alfa Romeo Stelvio. We’re having to stretch the terms of our timeline here, as the Bentayga began production in 2016, but the SUV’s importance can’t be understated. 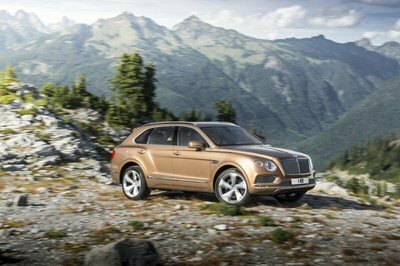 The Bentayga is Bentley’s first foray into the SUV realm. It marks a huge departure form the sedans, coupes, and convertibles the über-luxury brand is known for. Yet that luxury transcends the SUV title, making the Bentayga one of the most well-appointed three-row behemoths in the business. It rides on the same MLB architecture underpinning the Audi Q7, but comes powered by a massive 6.0-liter W-12 making 600 horsepower and 664 pound-feet of torque. As anybody could guess, an eight-speed automatic transmission and AWD are standard. The outrageous powertrain is able to defy physics when hauling this 6,000-pound SUV to 60 mph in just 3.5 seconds an onto the segment’s highest top speed of 187 mph. The Bentley Bentayga is redefining the boundaries of high-end automakers building luxury SUVs. We’ve already heard of promising future rivals; Mercedes-Maybach, Roll-Royce, and Aston Martin will soon join the segment, too. Of course, it takes Wall Street money to play in this elite crew. The Bentayga starts at $235,500 and can quickly cost nearly $300,000 with a few options selected. Read our full review on the 2017 Bentley Bentayga. As Ford considers killing off the Fusion, new entries to the crossover and SUV segments are popping up. The iconic Bronco nameplate is scheduled to return for 2020, and the ever-popular Expedition just got a refresh for 2018. But those vehicles are and will be expensive. Ford’s answer to the budget-constrained crossover lovers out there is the EcoSport – a tiny high-riding hatchback with a swinging rear tailgate and three- and four-cylinder engines. In truth, the EcoSport has been around for more than a decade in countries around the globe. It’s just now that Ford has decided to bring the EcoSport to the U.S. – from India, no less. Still, the EcoSport represents a good value to folks needing basic transportation but wanting to ride in style. As mentioned, power comes from small engines. The base mill is a turbocharged 1.0-liter three-cylinder making 123 horsepower and 125 pound-feet of torque. The 2.0-liter, naturally aspirated engine makes 167 horses and 149 pound-feet. A six-speed auto and front-wheel drive come standard, while AWD is optional with the 2.0-liter. 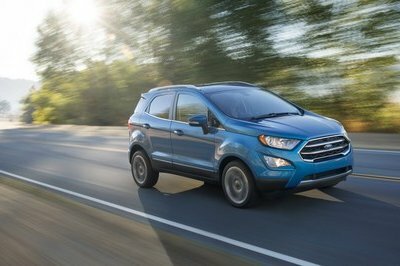 The EcoSport’s best selling point is its price: it starts at just $19,995 for the S trim. 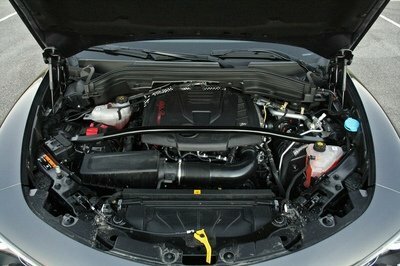 SE, Titanium, and SES trims progressively add more content. The SES tops the range and offers a sportier flare for $26,740. Besides the price, the EcoSport’s small footprint makes it a decent choice for inner-city living. Read our full review on the 2018 Ford EcoSport. The Jaguar E-Pace is like the F-Pace’s little brother whose name confuses everyone not close to the family. No, the E-Pace isn’t a hybrid electric or some fancy fuel cell. Rather E comes before F alphabetically and is therefore “smaller” than F – or so Jaguar’s marketing and product planning teams thought. The E-Pace rides on Jaguar Land Rover’s D8 platform, which also underpins the Range Rover Evoque and Land Rover Discovery Sport. It’s designed as Jaguar’s entry-level vehicle thanks to its size and a starting price around $38,600. 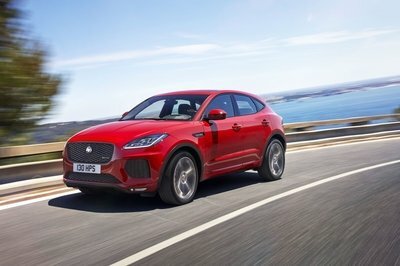 The E-Pace uses the same 2.0-liter turbo four-cylinder in all trim levels, though Jaguar bumps the power to 296 horses and 295 pound-feet of torque if you pay the extra $8,600 for the R-Dynamic trim. A nine-speed automatic and front-wheel drive are standard. AWD comes standard with the R-Dynamic trim. Read our full review on the 2018 Jaguar E-Pace. Who would have ever guessed Lamborghini would ever build an SUV? Well, it’s happened – again. It’s easy to forget the LM002 Lambo built as a military vehicle but soon became a civilian model best known by its nickname, the Rambo Lambo. So, while the Urus might not be Rambo’s “First Blood,” it’s undeniably a better performaner while adimately following Lambo’s modern design flare and brand ethos. Rambo’s new Lambo is powered by a twin-turbo 4.0-liter V-8 packed behind its headlights that makes an impressive 641 horsepower and 627 pound-feet of torque. An intelligent AWD system is designed to work in both off-road and high-performance situations, while its massive 285-series front and 325-series rear tires fight for grip. The sprint to 60 mph takes only 3.5 seconds and will hit 190 mph. The world didn’t need a Lamborghini SUV, but we’d argue we’re better off for it. 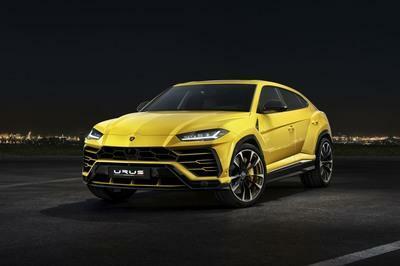 We all know the Urus will quickly become Lambo’s best seller, which will generate profits for even more ludicrous exotics and hypercars. The Urus will start around $200,000, which is a good discount over is corporate cousin, the Bentley Bentayga. Yep; the two share the same MLB underpinnings, though the similarities stop quickly after that. Read our full review on the 2019 Lamborghini Urus. The new Range Rover Velar is one sultry machine. Though it looks much larger, the mid-size crossover actually slots between the smaller Range Rover Evoque and larger Range Rover Sport. The Velar shares its architecture with the Jaguar F-Pace, but separates itself with sleeker looks, impressive off-road chops, and that Range Rover brand cache. The Velar impresses with a swanky, screen-filled interior with multi-use knobs that control more than one thing, but in an intuitive way. It offers seating for five in two rows of seating and three engine options to choose from. The standard is a 2.0-liter turbo-four running on gas. A second 2.0-liter turbo runs on diesel. Those fond of horsepower will enjoy the 380-horse 3.0-liter supercharged V-6. All engines are paired with the ever-present eight-speed automatic. 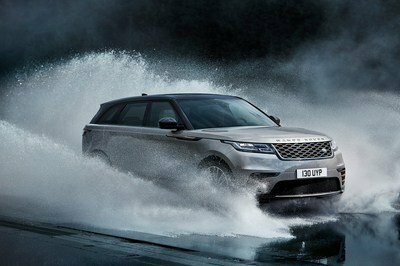 Naturally, Land Rover’s full-time 4WD comes standard, too. Pricing for this classy crossover begins just shy of $50,000. Those wanting the turbodiesel will have to upgrade to the mid-grade S trim and pay $56,000. The luxury-minded will find the SE model more befitting. That model starts at $67,400. Read our full review on the 2018 Range Rover Velar. Volkswagen is still wiping soot off its face from the #dieselgate debacle, but the Atlas should be the soapy shower the automaker needs. This three-row crossover was designed specifically for Americans and is built by Americans in VW’s Chattanooga, Tennessee plant. The Atlas’ square jaw and slab slides do their best John Wayne impression while a well designed and plushy interior offer Martha Stewart levels of hominess and comfort. Volkswagen offers several trim levels to choose from, meaning there’s an Atlas for most every middle-class family. Prices start at $30,500 and range up to $49,000. VW also gives families the choice between a 2.0-liter turbo-four or a 3.6-liter V-6, along with front-wheel drive and all-wheel drive. Options include things like tri-zone climate controls, adaptive cruise control, a panoramic moonroof, and navigation. 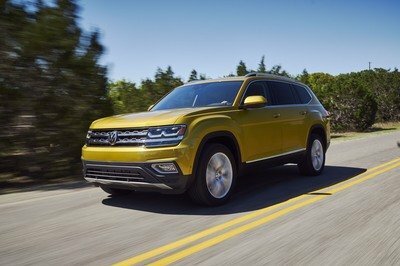 Read our full review on the 2018 Volkswagen Atlas. 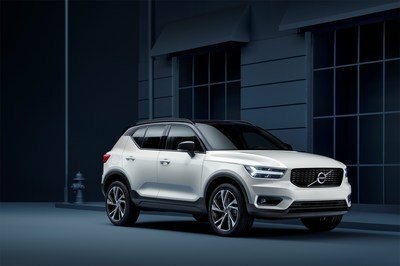 The XC40 is Volvo’s answer to youthful yet sophisticated families and empty nesters wanting to be youthful yet sophisticated. This compact crossover slots under the XC60 and way below in the wonderful XC90 in terms of size and price. The XC40 retains that modern Volvo design flare, but compresses everything into a neat little package. There is room for five inside, but four will be more comfortable. There’s cargo space with the rear seat folded down and the dash has plenty of impressive technology. A single 2.0-liter turbo-four is offered, but it comes in two output levels: 184 horsepower in the T4 model and 248 horsepower with the T5. The difference is a larger turbo on the T5. The T5 also comes standard with AWD, whereas the T4 only comes in FWD. The XC40 in Momentum trim starts at $35,200 and the R-Design trim starts at $37,700. Volvo is also offering its new Car By Volvo ownership option, where customers can pay a flat rate to basically rent the vehicle. Things like maintenance, insurance, roadside assistance, and other hassles are all included. That’s pretty convenient for those youthful yet sophisticated folks, regardless of their age. Read our full review on the 2018 Volvo XC40. Alfa Romeo is making a comeback in the U.S. – and a rather strong one, at that. 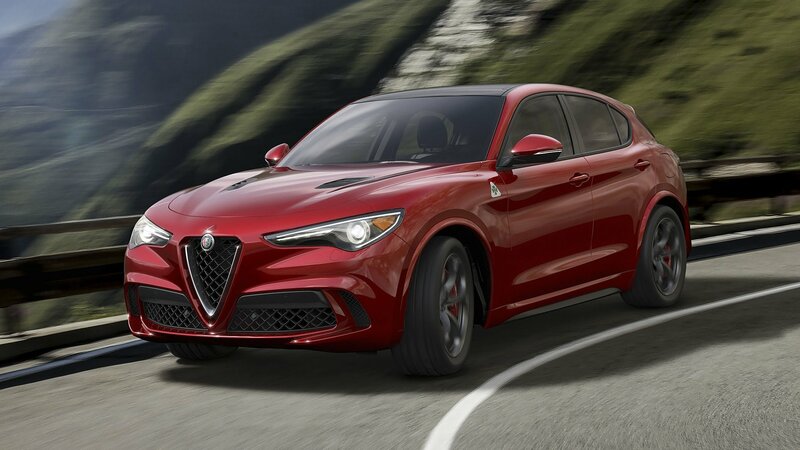 We’ve had the 4C sports coupe for a few years now, but it was the Giulia sedan in 2017 and this, the Stelvio crossover in 2018, that are bringing the Italian automaker to the American masses. Well, after spending a week with the Stelvio, I can say Alfa has done a fantastic job building a competitive crossover that butts heads against Germans like the Audi Q5, Mercedes-Benz GLC, and Porsche Macan. Last year, I sampled the Giulia Quadrifoglio, the outrageously powerful version with a Ferrari-derived V-6 and two turbochargers stuffed under its carbon fiber bodywork. Not surprisingly, the Stelvio feels very similar to the Giulia, despite my Stelvio tester not having the Quadrifoglio package. And while there are things I really don’t like about the Stelvio (which you can read about in the Four Things I Hate about the 2018 Alfa Romeo Stelvio), there are also some aspects I truly love. So, without further ado, here are four things I love about the 2018 Stelvio. The Alfa Romeo name is dripping with rich history dating back to 1910. The Italian automaker’s name is actually an acronym combined with Nicola Romeo’s last name, an Italian businessman who bought the company in 1915 and added his name in 1920. Alfa stands for “Anonima Lombarda Fabbrica Automobili,” or in English, the Lombardy Automobile Factory Corporation. Early success in racing solidified Alfa Romeo as a rightful player in Europe’s budding automotive industry. In fact, Enzo Ferrari rose to fame racing for Alfa Romeo from 1920 to 1939 before leaving to start his own company – a little automaker you might have heard of. For Americans, Alfa Romero also represents something different yet with that lovable European flair. Alfa isn’t a Mercedes-Benz or Audi or Porsche. They aren’t found in every parking lot in every suburban supermarket. They’re unique – at least for now. If FCA has its way, Alfa Romeo will become just as dominant as the German brands, though Alfa’s got a long way to go. In the meantime, we get to enjoy the exclusivity of Alfa’s new position in the U.S. market. Alfa Romeo’s unique grille design pulls from its heritage; it’s a look that dates back more than 50 years. Besides not looking like anything else on the road, it gives the crossover a slick appearance, even when it’s not moving. The sloping hood and bulging front fender help inject athleticism into the Stelvio’s nose. Its steeply raked windshield and sloping roofline mix well with its coke-bottle hips. Out back, the dual exhaust are well-placed within the black and satin chrome lower fascia. Yet despite its sporty nature, the Stelvio doesn’t forget it’s a crossover. The fenders and rocker panels are lined with black plastic flares and it offers decent ground clearance. Overall, the Stelvio has a healthy mix of SUV and sports car. It’s certainly handsome enough to compete against the Audi Q5 and Mercedes-Benz GLC. Despite its tallish stance, the Stelvio is extremely nimble on its feet. Body roll is kept to a minimum and the steering is impressively quick. Put on a back road, the Stelvio shows some impressive dance moves. 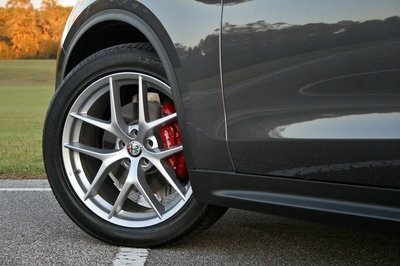 Even when pushed hard into a corner, the Stelvio’s all-season Continental tires hold on without complaint or plowing. It’s pretty impressive, actually. Of course, there’s a downside. Like I mentioned in my Four Things I Hate about the 2018 Alfa Romeo Stelvio article, the tight steering can make for a darty ride on the interstate. Still, that’s a small trade for an impressively stable crossover. Best of all, my tester is only the Stelvio Sport model. 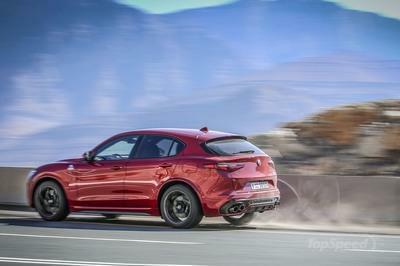 Imagine what the Stelvio Quadrifoglio will drive like! 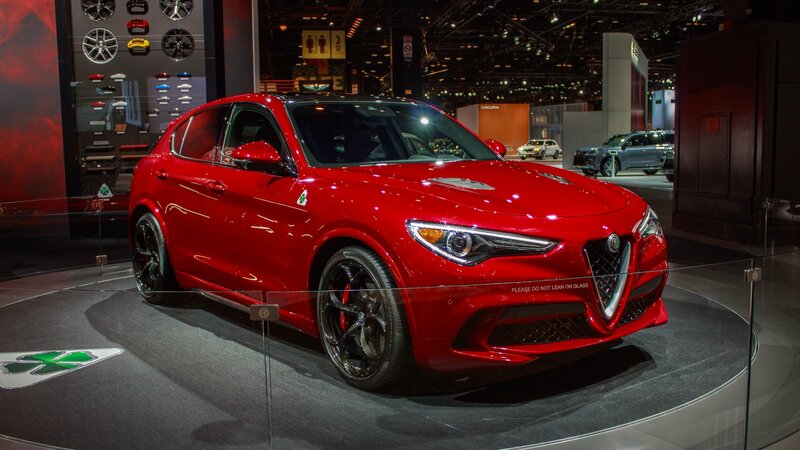 All non-Quadrifoglio Stelvios in the U.S. are powered by a potent, longitudinally mounted four-cylinder. It’s an all-aluminum 2.0-liter with single-overhead camshafts operating four valves per cylinder with direct fuel injection squirting in premium fuel. The intercooled, twin-scroll turbocharger then fill the engine with boost for some very stout numbers. The 2.0-liter turbo-four makes 280 horsepower at 5,200 rpm and 306 pound-feet of torque at only 2,000 rpm. The engine revs impressively fast, making its 6,200-rpm redline seem far too low. The turbo spools quickly with very little lag, giving power on request with no hesitation. The throttle can be dialed up to be more sensitive via the Alfa Romeo’s DNA selector knob. The D stands for Dynamic and is where all the fun can be had. The tried and true ZF eight-speed automatic does the shifting, and boy, does it work well. 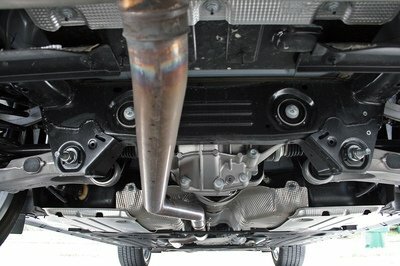 The transmission shifts nice and smoothly around down with no fuss or jerkiness. Put the DNA selector in D and slap the shifter into manual mode, and the ZF fires off shifts like a dual-clutch! The only thing missing are cracking exhaust blats between shifts. Behind that is the Stelvio’s Q4 AWD system. Not only does it help when the weather turns sour, but this rear-biased system makes the Stelvio feel lively in the corners. 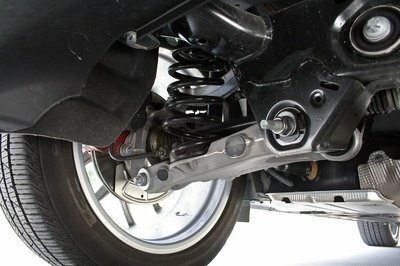 It allows the rear to slightly step out when in Dynamic mode, even with the traction control on. Rotate the DNA knob to the A, or Advanced Efficiency Mode, offers programming better suited for bad weather like heavy rain or in snow. There’s also the N, or Natural Mode, for normal daily driving. In total, the drivetrain, matched with the tight suspension and steering, make the Stelvio a very capable back roads burner. I’ve spent the week living with the all-new 2018 Alfa Romeo Stelvio. This new crossover is from a brand that’s new to the segment and new to mainstream consumer vehicles in the U.S. Under the watchful eye of Fiat Chrysler Automobiles, Alfa Romeo is trying hard to make its Stateside comeback with the Giulia sedan and this, the Stelvio crossover. While the Giulia is a fantastic sedan, it’s crossovers that are selling like hotcakes these days, so Alfa needs to nail the Stelvio. Thankfully for this Italian brand, there is plenty to love about the Stelvio, but there’s also a few things I just can’t stand. Keep reading for my four things I hate about the 2018 Stelvio Sport. And as always, let us know what you think in the comments. The Alfa Romero Stelvio might be a member of Fiat Chrysler Automobiles, but it doesn’t get FCA’s highly regarded Uconnect system. 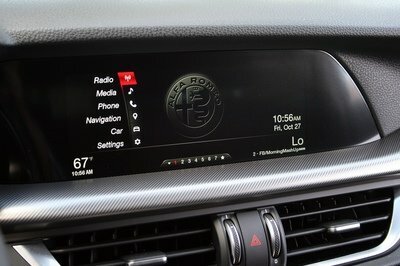 Rather, Alfa has its own system that relies on a dial and two buttons for navigating through the menus. There’s no touchscreen here. For the most part, the system works okay and is fairly intuitive to get around within. In practice, though, downward clicks via the rotary knob don’t always elicit a response. The menu within the vehicle settings page is also odd, with some items getting a sub-menu, while others are controlled right from the main page. The infotainment system also lacks Apple CarPlay and Android Auto. And though the main rotary dial has a black face, it’s not a trackpad. Like Audi’s infotainment system, inputting an address or other information is done by rotating the dial and scrolling through the alphabet, however, unlike Audi, you can’t just write the letter or number. Entering an address just takes longer on the Alfa and requires more concentration. Lastly, the system’s backup camera display is tiny relative to the screen’s 8.8-inch size. I found myself having to lean closer to the screen for a better view. The terrible resolution doesn’t help, either. 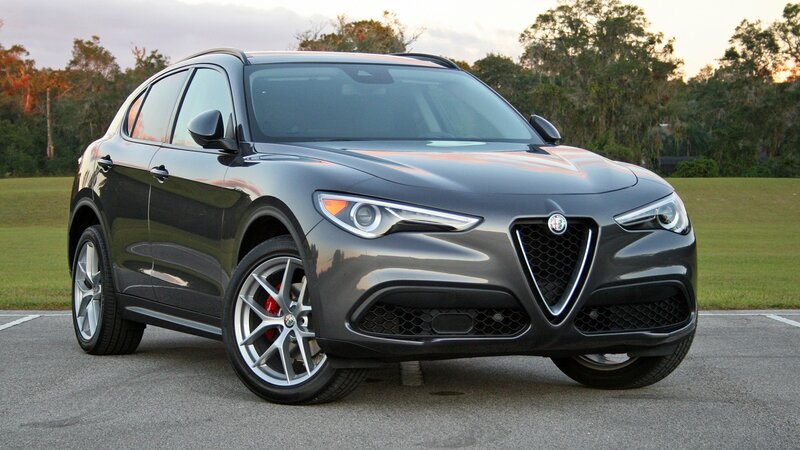 The Stelvio is a sporty crossover, even without the Quadrifoglio trim. In addition to its potent turbocharged four-cylinder, its steering is set up for instant responsiveness and minimal turns lock-to-lock. Honestly, the steering is some of the tightest and most rewarding I’ve sampled in a crossover. it’s actually very enjoyable when driving with gusto. But point the Stelvio down the open road, and the steering’s tightness becomes a downfall. Its on-center responsiveness is almost extreme. Even the smallest of inputs sends the Stelvio’s front tires changing direction. Combined with its taller stance and initial body lean, and the crossover can easily feel top heavy and boatish – sending occupants heads bobbling left and right. I couldn’t imagine being a second-row passenger with a steering-happy driver behind the wheel. Talk about getting carsick! The Alfa Romeo’s interior, for the most part, is rather nice. The materials feel upscale and the fitment between panels is tight. However, there are a few details that spoil the overall experience. For one, the electronic shifter feels cheap. It even has a rough edge around the top and just isn’t satisfying to use. The front seats could use a better design. They are stiff and have almost no bolstering. The bottom cushion is too short and leaves thighs feeling unsupported. The infotainment system’s main control knob doesn’t have as rich a feel as it should, either. Overall, the Stelvio’s interior is nice, but it has some things to improve upon. Topping my list of things I hate about the 2018 Alfa Romeo Stelvio is its brakes. 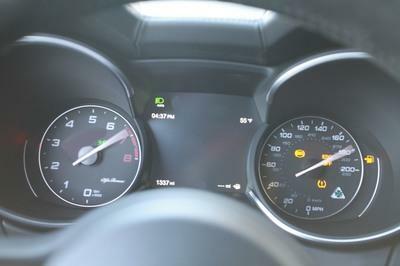 See, Alfa uses a brake-by-wire system, meaning there is no physical connection between the brake pedal and the hydraulic brake system. Behind the wheel, the brakes do a great job of stopping the Stelvio hard thanks to big four-piston Brembo calipers up front and single piston Brembos out back. On the highway, the brakes are easy to modulate, despite the brake pedal’s short travel. The problem comes with that short-travel pedal at lower speeds. It’s nearly impossible to smoothly ease pressure off the pedal when slowing. What feels like a millimeter of travel changes the braking from too little to too much. Slowing to a stop without a hard jolt at the end is basically impossible, regardless of how carefully I tried. Besides being intensely frustrating for me as a driver, it proved rough on my passengers. Being stuck in stop-and-go traffic is a nightmare. I’d rather deal with a heavy clutch pedal than these brakes. Alfa seriously needs to dial in more pedal travel to help make the brake bite more progressive and even throughout the pedal travel. Making it worse for Alfa, I had this same complaint with the 2017 Alfa Romeo Giulia Quadrifoglio I drove earlier this year. I even wrote an entire article ranting about it. On startup, the Stelvio beeps, bongs, chimes, and clangs for a good 10 seconds as the systems come online. Of the noises, the seatbelt reminder is the worst. It sounds like that ultra loud, mid-range-pitched bong that violently awakens airline passengers awake as the pilot needlessly breaks the cabin’s calm silence as the plane starts its initial descent. The Stelvio’s chime bad enough to induce a headache – or to retrain the driver to buckle up before turning the car on. 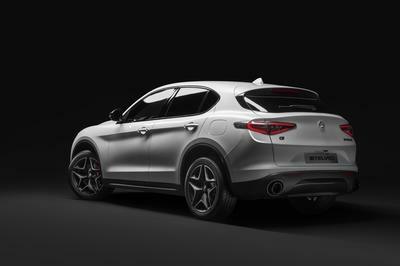 Those of you who have been waiting for the new Alfa SUV to reach the British market can now begin to get excited about it as the car is gearing up for market launch in September. The 2018 Alfa Romeo Stelvio will launch in the UK with a base price of £33,990. Teh top-of-the-line version is 10 grand dearer. There are four trim levels for the UK-spec Alfa Romeo Stelvio, including Stelvio, Super, Speciale and the limited production Milano Edizione. At launch, drivers will be able to choose between two engine versions – 2.2-litre 210hp diesel Q4 AWD and 2.0-litre 280hp petrol Q4 AWD – combined with an ZF eight-speed automatic transmission as standard. Standard kit on base models include 17-inch 10-spoke alloy wheels, LED rear lights and a double lateral chrome exhaust pipe, plus dual-zone climate control, Alfa D.N.A. 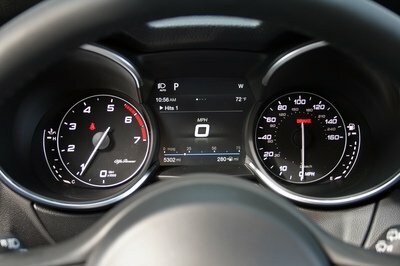 rotary driving mode selector, a 3.5-inch TFT colour cluster instrument panel, UConnect 8.8-inch display infotainment system with DAB plus Bluetooth/AUX multimedia connectivity, an eight-speaker audio system and two front and two rear USB ports. The safety kit is pretty satisfying, too. After all, Alfa Romeo Stelvio recently passed the EuroNCAP crash test with flying colors, gaining five stars thanks in part to its segment-first Integrated Brake System, Autonomous Emergency Brake with pedestrian detection, Blind Spot Monitoring, Forward Collision Warning and Lane Departure Warning. The limited launch version Alfa Romeo Stelvio Milano Edizione is probably the one everybody is going to go for. The main highlights of this model include sporty leather seats, a 10 speaker Sound Theatre, 20-inch V-Spoke alloy wheels, keyless entry, Athermic windscreen, privacy glass with black gloss window surround, electrically adjustable and heated front seats and a rear-view camera with dynamic grid lines. 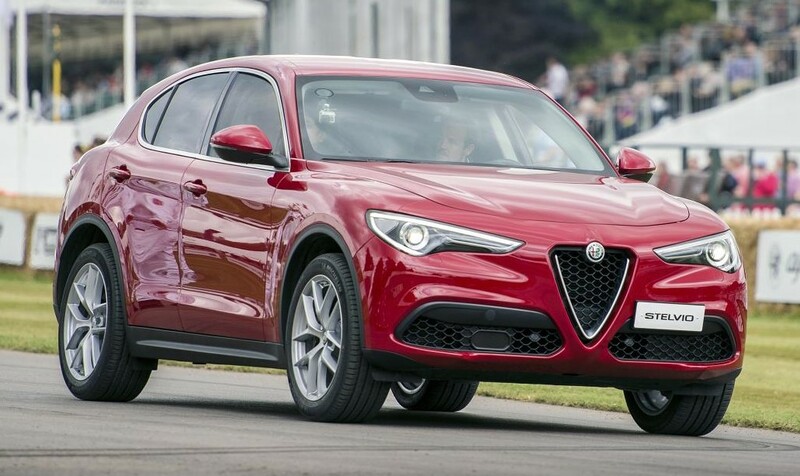 The post Alfa Romeo Stelvio UK Pricing and Specs appeared first on Motorward. Euro NCAP, an establishment that crashes new cars into concrete blocks to measure how safe they are, has awarded the new 2017 Alfa Romeo Stelvio with its maximum score of 5 safety stars. That was expected to be honest, because massive SUVs usually perform well in crash tests. But this may not be as good a news for Alfa as it might first appear. You see, in spite of all their brilliant effort, despite revamping the lineup and upgrading the looks and quality of their products, Alfa Romeo is still not doing brilliantly sales-wise as we’ve seen withteh Giulia. Now it wouldn’t have hurt so much if their cars were still rubbish, or, say, they scored only two stars in NCAP tests. But they are doing everything right and still nobody’s buying their cars. That ought to feel really crappy. At any rate, the success of Alfa Romeo Stelvio in Euro NCAP crash tests is not all down to its bulky size. The SUV also packs some fairly sophisticated safety options, namely Integrated Brake System (IBS) which significantly reduces braking distance thanks to its combination of electronics and mechanics, Lane Departure Warning (LDW), Blind Spot Monitoring, Forward Collision Warning (FCW) and Autonomous Emergency Brake (AEB) with pedestrian detection. The Stelvio will go on sale in Autumn. Here’s hoping it’ll do better than its sister, Giulia. 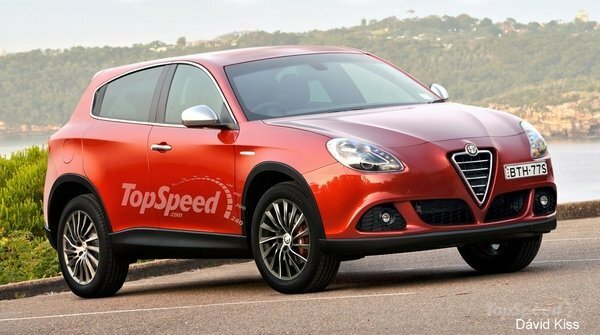 The post Alfa Romeo Stelvio Earns 5-Star Safety Rating appeared first on Motorward. When it comes to the U.S. automotive market, compact crossovers are cleaning up. The segment continues to see unprecedented growth, even with a huge variety of options already on offer. The appeal of the luxury compact crossover is multifaceted, mixing a “go anywhere, do anything” attitude with comfort and inherent driveability. Luxury compact crossovers are practical and spacious, without going overboard in terms of exterior dimensions, improving fuel efficiency and maneuverability over larger SUVs. Inside, there are amenities aplenty without breaking the bank, while the high seating position provides ample views of the road ahead. And while better suited for mall crawling rather than rock crawling, luxury compact crossovers still get that “off-roader” style, plus AWD when the weather turns sour. And of course, the extra room in the rear supports a range of lifestyles, whether its kid hauling for a family, or gear running for active outdoorsy activities. There are even performance options, if you’re into that kind of thing. Boil it down, and the philosophy goes something like this – mix equal parts practicality, comfort, and road presence, then spread evenly on a tall-bodied package. But where to start? 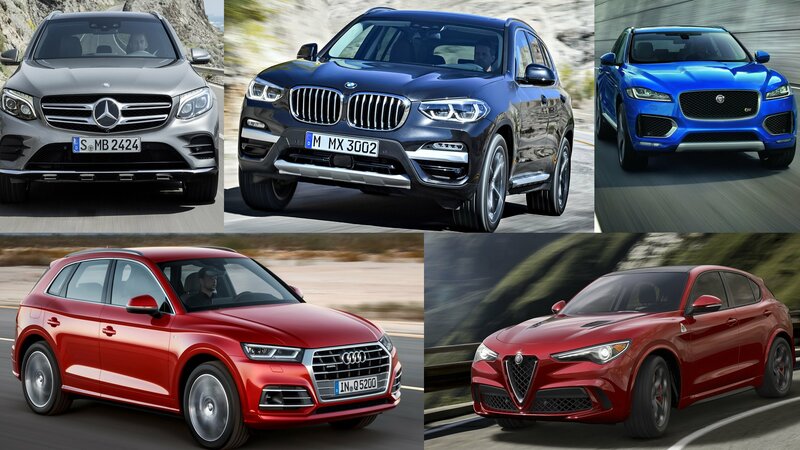 To help you navigate this seemingly bottomless sea of possibilities, we’ve collected facts and figures from five of the best entries in the segment, including the Alfa Romeo Stelvio, Audi Q5, BMW X3, Jaguar F-Pace, and Mercedes-Benz GLC Class. Read on for the lowdown. 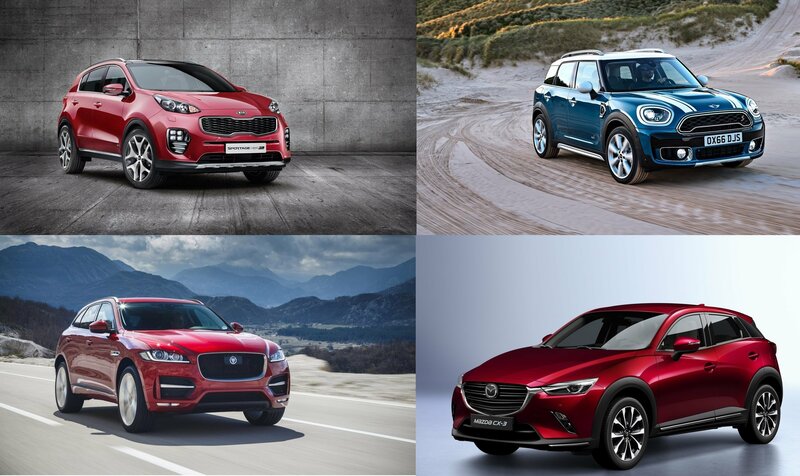 Continue reading to learn more about TopSpeed’s Top 5 Luxury Compact Crossovers. For as long as he’s been in the public spotlight, Jeremy Clarkson’s long-standing disdain for the letters S, U, and V is a matter of public record. This is a man, after all, who has managed to describe SUVs as “idiotic,” “boring,” and a “complete waste of money” on separate occasions. But just like the time snow actually fell on the Sahara, Clarkson is not above turning some heads with his opinionated commentary. Lo and behold, then, because the SUV Scrooge finally admitted to liking one. Stand up and take the applause then, Alfa Romeo Stelvio. Jezza actually likes you. The startling revelation on Clarkson’s column in the Driving section of The Sunday Times. Although true to form, Clarkson wasted little time adding another SUV to his “no-thank-you” list by throwing the Audi Q5 under the bus. Clarkson then pivots to the real subject of his column, the Stelvio, and to the shock of everyone, he actually had positive things to say about the Alfa Romeo SUV. He liked the design. He liked the interior. And, most shocking of all, he liked how it performed on the road, even while acknowledging that he was behind the wheel of a diesel version of the SUV. Ultimately, he even went so far as describing the Stelvio as “the only SUV that’s quite tempting,” and adding that the high-poweredStelvio Quadrofoglio “might even be irresistible.” Yup. Hell has frozen over. There once was a point when the auto industry could go through an entire cycle of years without Alfa Romeo being mentioned. Part of the Italian automaker’s obscurity can be attributed to the fact that it had no models to stand its legs on. But now, that has changed with the arrival of the Giulia sedan and the Stelvio SUV, two models that Alfa Romeo has high hopes for. You might even say that the company’s future could depend on how successful these two models are. 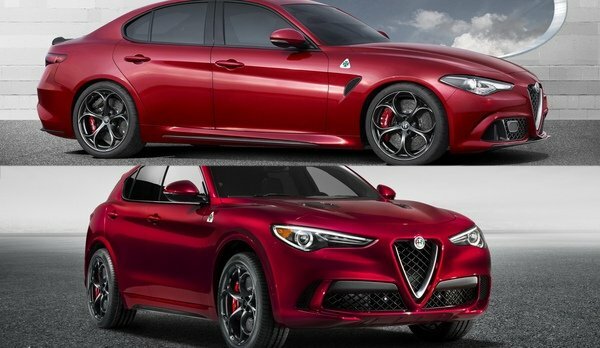 In lieu of that, it’s equally important to know that both the Giulia and the Stelvio, despite coming in two different sizes, are more alike than you think. From the design to the engines, both the Giulia and Stelvio rely on a number of shared qualities that could help propel Alfa Romeo to a more prosperous future or sink the automaker further down into the abyss of irrelevancy. Go ahead and check out what these similarities are. Continue after the jump to read the similarities between the Alfa Romeo Giulia and the Alfa Romeo Stelvio. Alfa Romeo has a lot riding on the success of the Stelvio SUV, so it only makes sense that the Italian automaker create as many different variants of the Stelvio as it can. 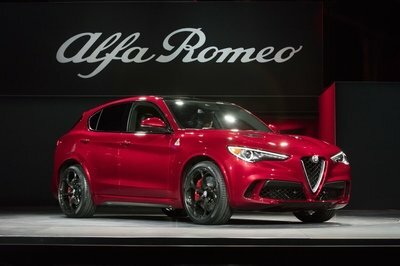 The high-performance Stelvio Quadrifoglio is expected to carry most of that responsibility, but Alfa’s mixing it up a little bit too with the release of the Stelvio First Edition, a limited run version of the SUV that packs plenty of discerning features for those willing to get a piece of it. Off the bat, let’s establish the fact that the Stelvio First Edition is based on the standard version of the SUV and not the Quadrifoglio. That’s an important piece of information considering that one of the latter’s most notable features is its Ferrari-derived 2.9-liter biturbo V-6 engine that spits out 505 horsepower and 443 pound-feet of torque. Instead, the Stelvio First Edition carries the smaller 2.0-liter four-cylinder engine that’s good for 280 horses and 295 pound-feet of twist. Let’s set that aside now and look at the things that makes the Stelvio First Edition a true special edition variant of the Alfa SUV. For that, the focus should be on the SUV’s exterior and interior where a host of unique items are scattered throughout the two sections. Some features are of the physical nature whereas others are more of the safety and technological persuasions. Either way, Alfa Romeo makes a good account of itself with the presentation of the Stelvio First Edition. It may not have the roughhouse power of the range-topping QV, but as far as being a special edition model is concerned, it checks off a lot of boxes. Continue after the jump to read more about the Alfa Romeo Stelvio First Edition. Having already returned to being a relevant carmaker thanks to the 4C sports car and the Giulia sedan, Alfa Romeo is getting its vehicle development plans into high gear with several fresh models by 2018, two of which will be SUVs. The first hauler was originally scheduled to hit showrooms in 2017 and it made its global debut at the 2016 Los Angeles Auto Show. It goes by the name Stelvio and will compete against the likes of BMW X3, Audi Q5, Jaguar F-Pace, and Porsche Macan. Unlike most of its rivals, Alfa Romeo also developed a high-peformance version of the Stelvio, and just like the Giulia sedan, it wears the green Quadrifoglio badge. But the badge isn’t the only thing that the two nameplates have in common. The crossover itself is based on the sedan, sharing many components in the chassis and drivetrain, as well as the same styling language. 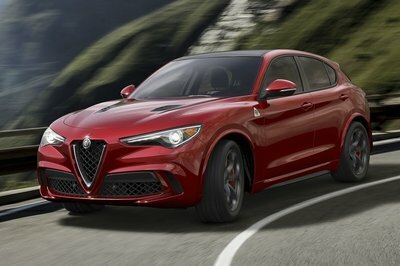 What’s more, the Stelvio Quadrifoglio will hit the streets with the same 2.9-liter V-6 rated at more than 500 horsepower! As it is the case with all automakers that jumped on the SUV bandwagon recently, Alfa Romeo hopes the new rig will help increase its global sales. Specifically, the SUV is part of a business plan that includes eight new vehicles and global annual sales of 400,000 units by 2018. In 2014 and 2015, Alfa Romeo delivered fewer than 70,000 cars. Will the Stelvio make a difference? Join me in my review to find out. Continue reading to learn more about the Alfa Romeo Stelvio Quadrifoglio. With Alfa Romeo finally selling its 2014 Alfa Romeo 4C within U.S. borders after several years of delays and setbacks, it appears the Italian brand is getting its vehicle development plans into high gear. Alfa says it will launch eight fresh models by 2018, two of which will be SUVs. The first SUV will debut sometime in 2016 and compete against the likes of 2017 Audi Q5, 2017 BMW X3, and 2015 Lexus NX. The trio will provide plenty of competition, but Alfa – under the direction of the FCA team – plans to offer a wide range of drivetrains that will cover anything from fuel-efficient gasoline and diesel versions to high-performance haulers. Though FCA is still mum on the details, sources close to Alfa Romeo claim the SUV will be based on the Giulia sedan. According to Automotive News, European sales are likely to commence in September or October 2016 with a U.S. launch to follow about three months later. As it is the case with all automakers that jumped on the SUV bandwagon recently, Alfa Romeo hopes the new rig will help increase its global sales. Specifically, the SUV is part of a business plan that includes eight new vehicles and global annual sales of 400,000 units by 2018. In 2014, Alfa Romeo delivered fewer than 70,000 cars. Updated 06/28/2016: Our spy photographers caught the upcoming Porsche Panamera out for a new testing session, and for the first time they also managed to take some shots of the interior. 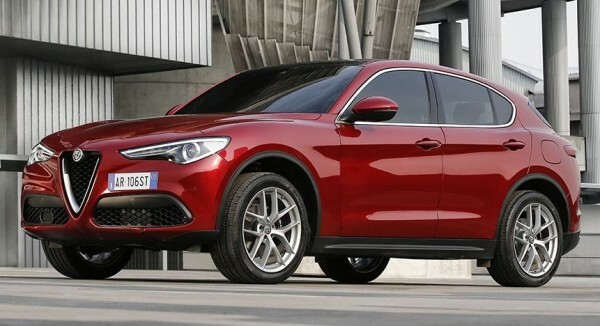 Continue reading to find out more about the upcoming Alfa Romeo SUV.